We spent about 2 months in the Yukon, Canada, last year and most of it was in a small town called Tagish where the population is about 400. We had the most amazing time through a HelpX exchange - really getting to know some of the locals and making some great lifelong friends. Everyone we spoke to in Tagish told us we had to go to Dawson City. We hadn't planned on going there, especially as it was an 8 hour drive away but they were very convincing! And they gave us a list of must do's whilst we were there. They're a pretty wild bunch over in Tagish, so we knew we would be in for a good time. And a good time we did have! We spent 24 hours there in June and highly recommend going in summer. Being so close to the artic circle at that time means that the days are super long - it's seriously an amazing experience, it feels like the sun never sets. Here's our MUST DO list if you have 24 hours in Dawson City. We do like to do the tourist thing and take pictures at welcome signs, but the Dawson City sign is probably our favourite. I mean, look at it! It's way cool. You have to agree, it's not your average welcome sign. When you enter the town of Dawson City, you will feel like you have stepped back in time. Remnants of the old Klondike gold rush era remain, along with dirt streets and historical buildings. It has a very chilled but authentic vibe going on. Dawson City was the centre of the Klondike gold rush following the discovery of gold back in 1896. In it's peak, the population of the town was around 40,000 but today there are less than 2,000 permanent residents living there. Take a guided or DIY walking tour - soak in the history and admire the detail that went into the old buildings. I always worry about the quality of cocktails in a small town, but they made a mean Espresso Martini at Bombay Peggies. It's a cool little spot with inside and outdoor seating AND it used to be a brothel! Delicious Greek food. Need I say more? No seriously, a really good feed and massive portion sizes! No, it's not just a quirky name for a cocktail. It is actually a rotten toe in a shot of whiskey. And you drink it. And you pay to drink it! But you do get a certificate! We weren't going to do this, but the locals of Tagish told us we HAD to, so we did. Find out more about the origins of the sour toe cocktail here along with why they've had to keep replacing the toe! Operating since 1971, Diamond Tooth Gerties is Canada's first casino. 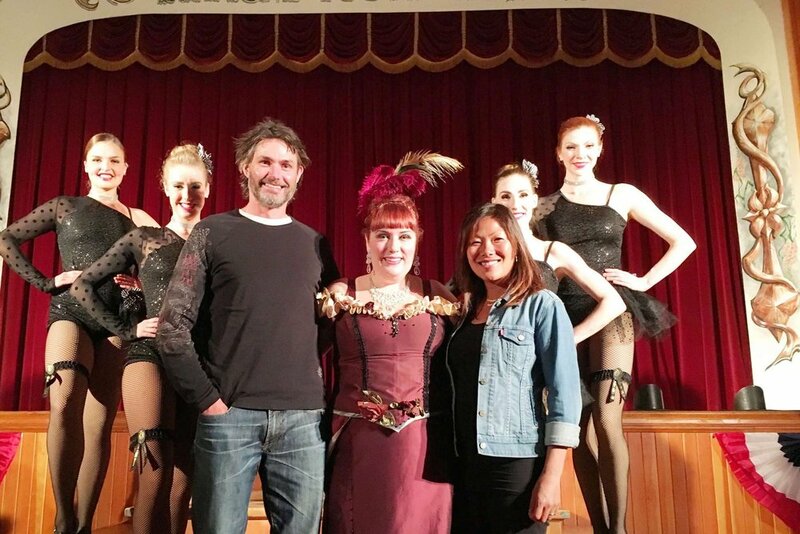 Make sure you catch one of their shows, which is set during the Klondike era, complete with live piano and dancing girls! They have several shows a night and entry is a bargain at $12. The Westminister Hotel is known as 'The Pit' by the locals. This 1898 building is as authentic as they come - we were told it would give us a taste of the less touristy side of Dawson City and we were guaranteed to find some interesting characters there. Unfortunately, we didn't make it in there but we got a photo out the front. It was a Tuesday night and there wasn't much happening in there so we decided to skip it and head back to our hotel. That's almost midnight by the way, that's how bright it still is at night during summer! And finally, the morning after - whether you are nursing a hangover or feeling fresh as a daisy, head up to the dome for some great views of Dawson City and all that surrounds it. We stumbled upon this poem written on one of the old buildings which really sums up the life during the time of the gold rush. It's called The Spell Of The Yukon by renown English poet Robert W. Service. Have you been to Dawson City? Do you have any other must do's to add to this list? Let me know in the comments below!